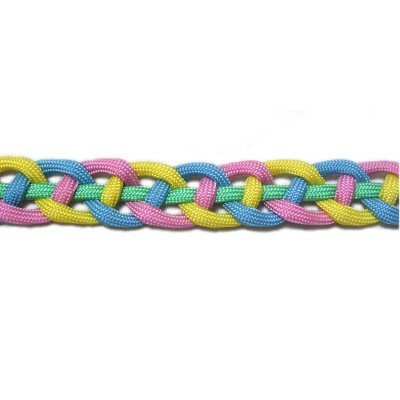 Description: The Wave Braid features three cords that curve in a wavelength pattern around a straight holding cord that runs through the center. 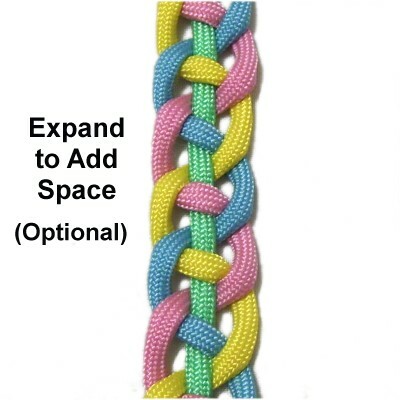 The best way to make the braid look neat is to push the cords close together as you create it, then expand and stretch the design to add extra space when you are finished. This form of braiding can be a challenge. When practicing, be sure to use four different colors. Focus on understanding the concept as you progress through the steps described below. Step 1: You need four 36-inch cords to practice the Wave Braid. 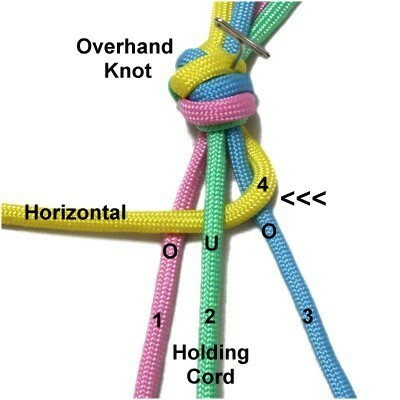 Tie them together with an Overhand knot near one end of the cords (optional). 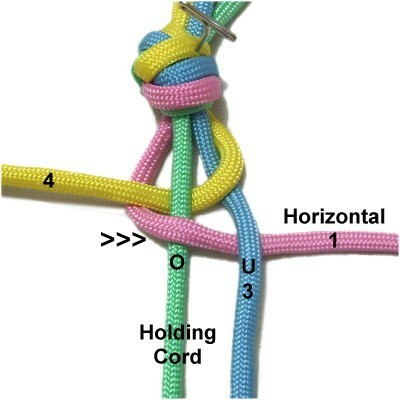 Cord 2 is the holding cord, and should remain straight. Secure it near the front of your board with tension. Start the braiding with the working cord furthest to the right, which is cord 4. Move it over cord 3, under the holding cord (2), and over cord 1. Make sure cord 4 remains horizontal when you are through. Designer's Tip: Place a pin on each side of the braid, so you can drape the cords over the pins to keep them horizontal. You don't need to actually secure the cords after you move them, since they will only be horizontal for a short time. Step 2: Now you use the working cord to the LEFT of the holding cord, which is cord 1. Move it over the holding cord, then under cord 3. It should remain horizontal when you are done. Each step begins by moving one working cord to a vertical position, where it's combined with the holding cord so you always have two to weave through. When choosing which working cord to weave, you alternate between the working cord resting to right of the holding cord, and the one resting to the left of it. Each working cord remains horizontal for one step. 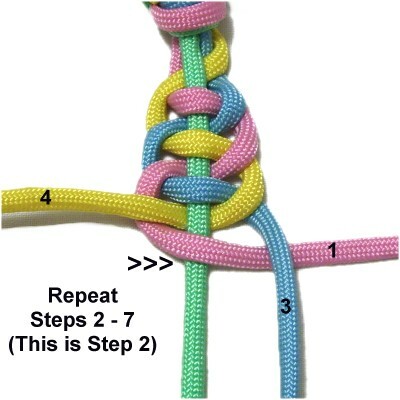 Then it's arranged vertically in the following step. After that, it's moved horizontally again, but in the opposite direction. Each time you move a working cord right to left, you pass it under the holding cord, and over the cord next to it. When moving left to right, it's the opposite (over - under). The arrows in the images show the direction. 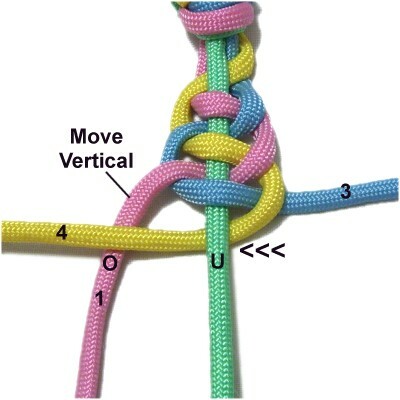 Remember that you are making a wavy pattern with each cord, so the cords should be CURVED. Make sure you don't fold the cords or allow the material to become kinked. 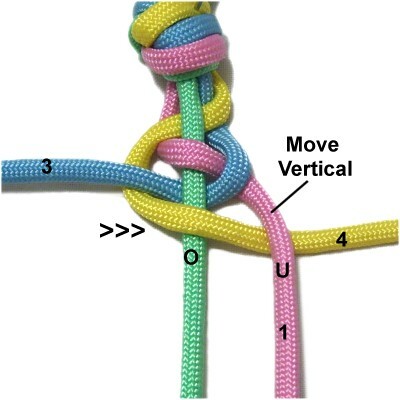 Push the woven portions close together while constructing the braid. When it's completed, you can stretch it and the spacing will be more even. Step 3: Move cord 4 to a vertical position. 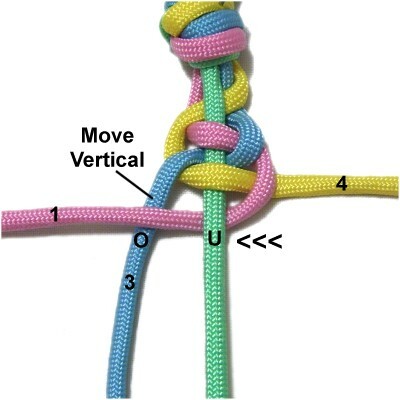 Now you will weave cord 3, since it rests to the RIGHT of the holding cord. You are moving right to left, so pass it under the holding cord and over cord 4. Keep it horizontal when you are done. Step 4: Move cord 1 to a vertical position. 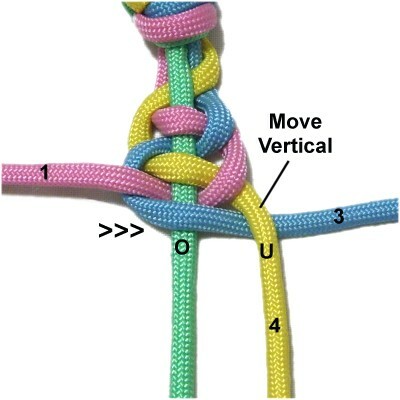 Now you weave cord 4, since it rests to the LEFT of the holding cord. You are moving left to right, so pass it over the holding cord and under cord 1. Leave it horizontal when you're finished. Step 5: Move cord 3 to a vertical position. Cord 1 is to the RIGHT of the holding cord, so pass it under the holding cord and over cord 3 (right to left). Keep it horizontal after you are finished. Step 6: Move cord 4 to a vertical position. Cord 3 is to the LEFT of the holding cord, so pass it over the holding cord and under cord 4 (left to right). Step 7: Move cord 1 to a vertical position. 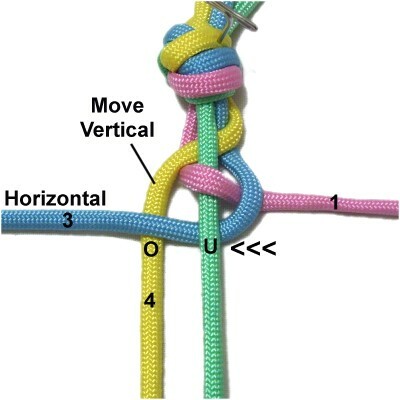 Cord 4 is to the RIGHT of the holding cord, so pass it under the holding cord and over cord 1 (right to left). Step 8: Repeat steps 2 - 7 several more times, until the Wave Braid is the size you wish to make. This image shows step 2. Before you finish, expand the weave to add some space, until you can clearly see the curved elements. This is optional if you prefer a close weave. Make adjustments to the tightness and spacing before moving on. 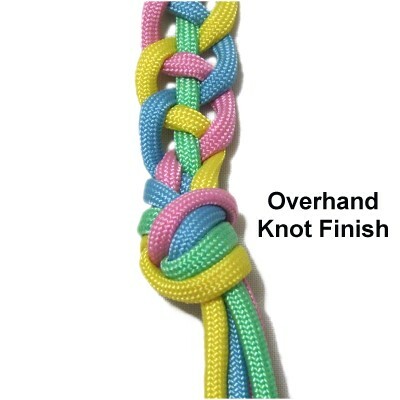 To finish the Wave Braid, you can simply tie another Overhand knot, or use a different knot to secure the cords. Have any comments about the Wave Braid? Contact Me.